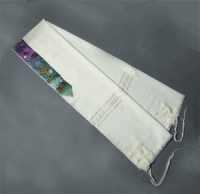 Atarot and tallit are created using symmetrically hand-dyed silk so that when worn, the color is consistent throughout. 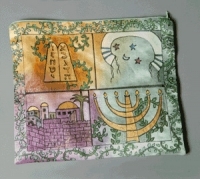 The design is then drawn on the silk with a fine fabric pen and painted in many layers with fabric paint. 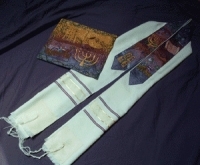 The atarah can be personalized with a Hebrew name at the neck portion. 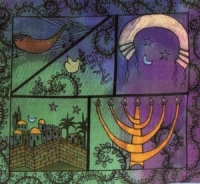 Finally, the atarah is sewn on a wool crepe tallit that is embellished with the colors of the atarah in the striping.